To develop an in-depth research process and eliminate blunders it is essential to have an investing checklist. A checklist helps in simplifying the research process, which looks very complicated otherwise. We will share our comprehensive investing checklist that covers various important parameters that one should consider before investing in a business. It will also act as a template for you when you do research on your own and will shorten your learning curve. The objective of this particular webinar is to help the participants get a 360-degree view of our investment checklist. All the points that have to be looked into while researching a particular company and logic behind each one of them will be shared. A checklist can help you prevent blunders, which prove to be very costly in investing world. Be it a newbie or an experienced one, it's a must for anyone looking to sharpen their equity research skills. An investor needs to evolve on a regular basis. Just like we upgrade or software or mobile, we also need to upgrade our investing skills. A comprehensive framework and template for your future research work on companies. 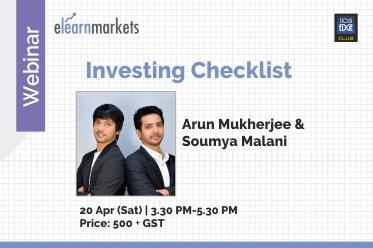 Arun Mukherjee and Soumya Malani are founding partners of SA Investment Advisors, a SEBI registered investment advisory firm. They specialise in identifying winners in small and midcap segment at an early stage. In conjunction, they conduct workshops and have trained over 2,200 professionals in the field of financial investments in India as well as abroad in Singapore, Dubai, etc. Both of them have the honour of being guest columnists for ET Markets and Moneycontrol. Mr Mukherjee has experience with 265 listed companies to date & has always followed and believed in the practical approach to learning. Business Today has covered Arun Mukherjee as "The Microcap Investor of India" whereas Soumya Malani has Secured all India rank in CA & CS examination & received "Brilliant Performance" award twice in all India National Accounting Talent Hunt. Mr Mukherjee has over 44,000 followers on Twitter, whereas Mr Malani is followed by over 14,000 people on Twitter.